MPs returned to the House of Commons, during the week commencing 07 January 2019, after their Christmas break. Debate for the third reading of the Finance (No.3) Bill was held on 08 January 2019. Although this should have been relatively straightforward, an Opposition amendment tabled by Yvette Cooper was included. The amendment is related to Brexit and restricts the ability of the Government to levy taxes without prior Parliamentary approval in the case of a no-deal Brexit. The Commons has approved a negotiated withdrawal agreement and a framework for the future relationship. 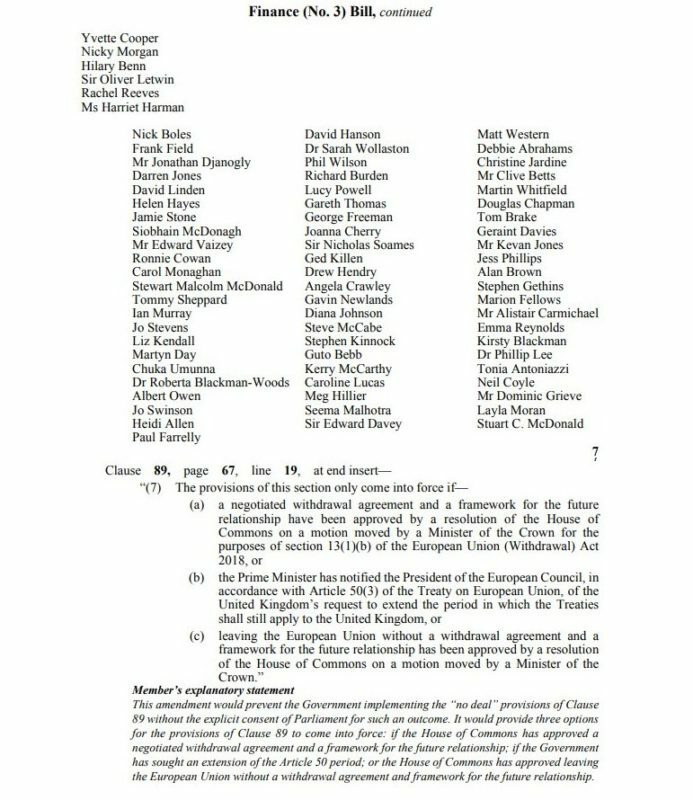 The amendment received cross-party support, with a number of anti-Brexit Conservatives such as Dominic Grieve, Anna Soubry, Nicky Morgan and Sir Oliver Letwin, amongst others, adding their names to the amendment. The Government asked their MPs not to support the amendment. The amendment was voted on and passed by 303 to 296 votes in favour. Debate in the House of Commons started (on the 4 December 2018) to approve, or otherwise, the Withdrawal Agreement and Political Declaration agreed between the UK and EU. The first significant item to be decided was an amendment proposed by Dominic Grieve, to the Business of the House Motion on the Withdrawal Agreement. The amendment allows motions under section 13 of the European Union (Withdrawal) Act 2018, to be amended. This means that, for example, if the Government was to table a new motion, were it to lose a vote on the deal agreed with the EU, MPs would be able to add further amendments to it. MPs voted to approve this amendment by 321 to 299 votes. In this vote, disloyalty within the Conservative party was evident with 25 Conservative MPs, mainly in favour of Remain, voting against the Government. Prime Minister Theresa May then opened the debate on the Withdrawal Agreement, starting five days of debates with 8 hours per day allowed for discussion followed by the “Meaningful Vote” on the final day. On the 18th June 2018, Lords debated the EU Withdrawal Bill following its return to the House of Lords as part of the “ping-pong” stage. Folowing debate and votes, there are now 4 outstanding amendments to the Bill which will be returned to the Commons for consideration on 20 June 2018. The only amendment which is likely to go to a vote will be on the “meaningful vote” amendment. The Lords voted 354-235 in favour of this amendment, Motion F3 aka Grieve II, by Viscount Hailsham tabled on behalf of Dominic Grieve. Current thinking is that the Government will strongly resist the amendment. It is unclear if the Government is defeated on this amendment, whether a vote of no confidence could take place. An alternative if this happened, could be for the PM to resign and/or call for a General Election. In my opinion, I think it highly possible that there will be a General Election called before the UK leaves the EU. Is the recent announcement of increased funding for the NHS partly funded from the non-payment of membership fees to the EU club, an attempt to sweeten a posible General Election in the Autumn? Have preparations started in case of a no-deal Brexit ? (If they haven’t already started 2 years ago !! ). The apparent intransigence of the EU negotiators indicates a lack of negotiating in “good faith” and they appear to dictate rather than negotiate terms for the Withdrawal from and Future relationship between the UK and EU there is a strong possibility that a deal will not be reached. The European Union (Withdrawal) Bill returned to the House of Commons from the House of Lords on Tuesday 12 June as part of the process known as “ping-pong”. 15 amendments were added to the Bill by the Lords and were debated over the 12th and 13th June in the House of Commons. The Government accepted one of the amendments, 8 were rejected, and MPs accepted Government changes to the remaining 6 amendments. A major issue concerned an amendment that would allow MPs to decide the next course of action if Parliament were to reject the Government’s final Brexit deal with the EU or if no deal is reached. This would hand control of the negotiations to MP’s to set and negotiate a Brexit deal with the EU. A number of “remainer” Tory “rebels”, led by Dominic Grieve, had threatened to vote against the Government (of which they are a part) unless significant concessions were made. Tory MP Philip Lee resigned from his role as a junior Justice Minister in order to vote against the Government. The PM held talks with more than 14 Tory rebels prior to the vote and appeared to have persuaded the rebels not to vote against the Government. She promised to address the rebels concerns in an amendment to be returned to the House of Lords. The Government won the vote by 324 votes to 298. Following the votes, there was little time left to debate concerns raised by the SNP over Brexit and its affect on devolution. This sparked a walkout by all SNP MPs during Prime Ministers Questions after their leader Ian Blackford clashed with the Speaker John Bercow. 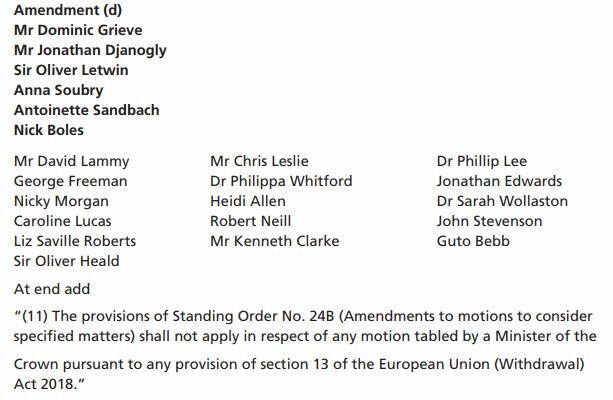 Labour were not without their own troubles with 75 MPs voting in favour of the amendment for the UK to join the European Economic Area after Brexit and 15 voting against. The labour party leadership had ordered its MPs to abstain. This also caused 5 MPs to quit their front bench posts in order to vote. Th Bill was subsequently returned to the House of Lords for further debate due on Monday 18th June 2018.